Description: Mortal Kombat 4 was the first full 3D Mortal Kombat game ever. The classic used real life digitized 2D characters. Midway company made a change with Mortal Kombat 4. Some people loved it while others hated it. Personally I always thought it was fun to play. Mortal Kombat 4 has 15 characters to choose from and battle with. 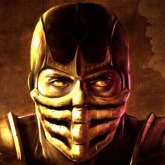 My personal favorites are Sub-Zero, Scorpion, Liu Kang and Johnny Cage. A lot of awesome fighting fun is to be found here. Be sure to lookup moves and finshers, if you are into this brutal game. Game Controls: Enter Key = Start Button. Arrow Keys = Move. J, K, Q, E, Space Bar Keys = Action Buttons.